BMW's executive saloon remains the benchmark by which all other contenders in the class are measured by. BMW's archetypal executive saloon remains the benchmark by which all other contenders in the class are measured by. This sixth generation car arrived in 2010, BMW taking a slightly more conservative route than it had with its predecessor. It's still as good to drive, but comes with less extrovert styling, more comfort and even better economy, make it a compelling choice in this sector. 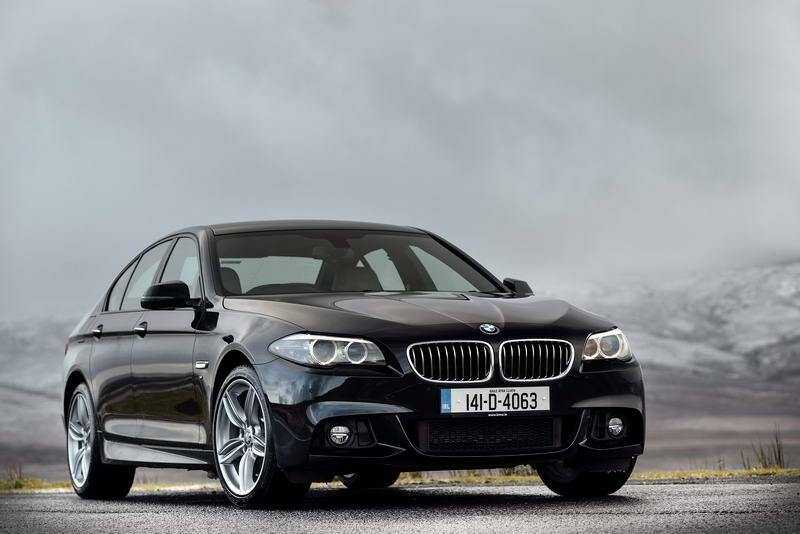 BMW Ireland might offer its customers the whole suite of BMW 5 Series models, but a quick scan of the classifieds suggest only the 518d and 520d models ever roll out of its plate-glass showrooms. Thank the taxation system; though don't think that the two entry-level diesel choices limit the 5's appeal - quite the opposite. The 518d is a fine car, the 520d adding a bit of pace without penalising too much on economy and emissions. If that's your goal the 520d EfficientDynamics models make some useful economy and emissions savings over the already clean and green 520d. Specifications follow the BMW norm, so there are SE, Luxury and M Sport models, even the SE coming with leather upholstery, air conditioning and an electrically powered driver's seat. There's an extensive options list too, so look for cars that have been optioned with Bluetooth telephone connection, iPod playback and satnav as they're not only useful but desirable should you sell it again. Being an executive saloon an automatic gearbox is worth having; choosing a car so specified only marginally increases the emissions (from 132- to 137g/km on a 2010 model). The manual six-speed gearbox offers a pleasing shift if you're happy to do without the automatic. There's a Touring (estate) model too, which adds self-levelling rear suspension to better cope with its load-lugging role. M Sport models gain larger alloy wheels and firmer suspension, as well as a more obviously sporting body kit. A 520d M Sport with an automatic transmission is about as rounded and capable and good looking a 5 Series as you could possibly ask for. If the M Sport's more assertive looks don't suit then an SE will work - the 520d in any guise is a brilliant car.